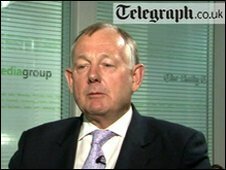 The man who arranged for leaked MPs' expenses details to be given to the Daily Telegraph has been named. Former SAS man John Wick acted as a broker, passing the details from an anonymous source to the newspaper. Mr Wick said the version of the expenses which the Commons was due to release had lots of details removed and he felt the public had a right to know. Mr Wick said he had no regrets, but that his main concern was how serious and unknown the consequences might be. In a video interview, he told Telegraph.co.uk: "The biggest problem was knowing you had to do something but not knowing how violent the writhing of the snake was going to be. "We were going to hold on to something at the end and not know how long it was and how sharp its fangs were. But sometimes you've just got to step out." Mr Wick added that he felt there was an injustice in how much information the government wanted to have about the public, while they wanted to keep their own affairs secret. He said: "We've all had - you as the media, we as the public - have had concerns about the expenses and how they've managed it, purely because of how they've handled our request for information. "We've reached the stage in society where they want to know everything about us, I think we're entitled to know about them." He said claims records he had seen suggested that had the information been released through official channels, and not by a newspaper, much of the incriminating detail would have been censored. Mr Wick said: "There was an un-redacted version and two redacted versions. And the briefing I was given is the fees office had sent them back twice for MPs to cover and take things out. "[It was] not going to come out as you have been publishing it, because you'd get the third redacted version. "The stuff that comes out... it would have been highly sensitised." Mr Wick did not comment on whether the Telegraph paid for the information, but did say that one tabloid had offered money for the details of certain individuals. "This was not information which was to be sold to the highest bidder and was probably best suited to a serious newspaper," he said. He insisted the data was not stolen, but was "an unregistered copy" obtained "as a result of lax and unprofessional security procedures used in the House of Commons". "The protective classification given to this project was described to me... as offering the same protection as a wet paper bag," he said. The BBC's Reeta Chakrabarti said Mr Wick says he is a supporter of the Conservatives but he was not motivated by party political concerns. She said he was not the actual source of the leak, but was contacted by a man inside Parliament who at first gave him five names in order to test the authenticity of the information. She added that the Metropolitan Police and the Crown Prosecution Service had said Mr Wick would not face any charges as the information is not a threat to public safety and is in the public interest. Mr Wick, who served in the SAS during the 1970s, now works with a City of London firm that advises insurance companies on how to manage their risk.